The Many Ways to Say ‘I Do’ ! Looking for that WOW factor for that big special day? Have your guest enjoy a #FlyingLionExperience by having us at your wedding. 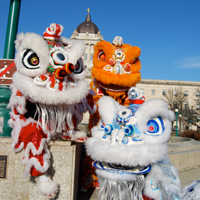 We are Winnipeg’s only Chinese Lion Dance team, specializing in the creative culture and traditions. The lion brings good luck and prosperity to all occasions. We guarantee a fun show filled with laughter, joy, lots of cuteness and performance to leave you and your guests wanting more. A Flying Lion Wedding performance brings you a customize show integrating both traditional and modern acrobatic trick sets to exhibit the lion to life. Book us today! 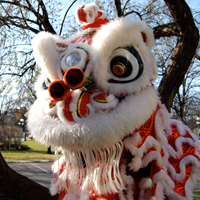 Want to know when the next Flying Lion Dance Troupe shows are? Another way to keep connected on latest pictures and videos? Follow us on Twitter @FlyingLionsWpg and Instagram @FlyingLionsWpg! Check out the latest pictures from our shows. 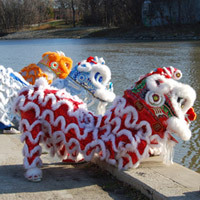 Flying Lion Dance Troupe was first established in November of 2006 by six members varying in ages but all with one thing in common, the dedication towards lion dance and educating the community about the Chinese tradition. With hard work, we have been developing the business aspect as well as training twice a week. After many brainstorming sessions, the name ‘FLYING LIONS’ best fitted the team’s views. Being a Flying Lion means to have a constant strive to reach for your goals and to never give up. The team is looking to provide exciting, action packed shows with high energy music, new innovative routines and trick-sets. By coordinating the lion’s movements along with the music, the lion’s actions are brought to life and make for a show that will leave you in awe. Our performance will magnify your atmosphere with the incredible sights, sounds and fun that comes with a Flying Lions performance. No matter the occasion, be it Chinese New Years, a wedding, birthday, anniversary, grand opening, banquet, or any other joyous occasion we’d love to help you celebrate! If you have any questions or concerns regarding the shows or rates please feel free to email the team and we will get back to you as soon as possible, in case of short notice please contact by phone.